When you have a grieving child, it can be incredibly difficult to find words of comfort. Stories, of course, are one of the best ways to connect with our kids. But when your child is suffering from loss, they can also provide hope and comfort. Whether your child is grieving the loss of a pet or a loved one, remember that stories can be strong medicine for dark days. No matter how much we long to protect our children from sorrow, loss touches all of us. Here are picture books to help you weather the storm. We hope this list offers you and your children a way through the sorrow, and a comfort for grieving hearts. You've got it. 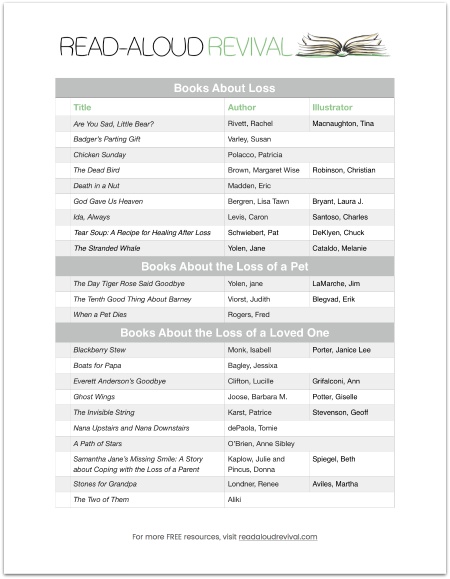 Check your email in a few minutes-- your printable booklist is on the way. Please pass this list on to others who may need it. And if you have recommendations to share, add them to the comments.